After opening a 1,500 square foot wine bar in Fresno on the NE corner of Cedar and Shepherd, owners Chuck and Jen Van Fleet built quite a lunch and after-work following in 2006. They gathered with friends, tasted, toasted and favored bottles of wine together. By 2011, the couple believed their regulars were ready for an expanded food and wine experience. This summer Vino & Friends Wine Store & Bistro celebrated it’s first anniversary and expansion in the new tasting room, August 4, 2012. The new digs are four doors down in the Via Montana Shopping Center. With chef Katie Parker creating the menu, and a 750 ft. private party room for big groups, food service is now carefully paired, using over 40 wines by the glass or a 300+ bottle line-up. The energy in the air vibrates as people come to meet and hang out. 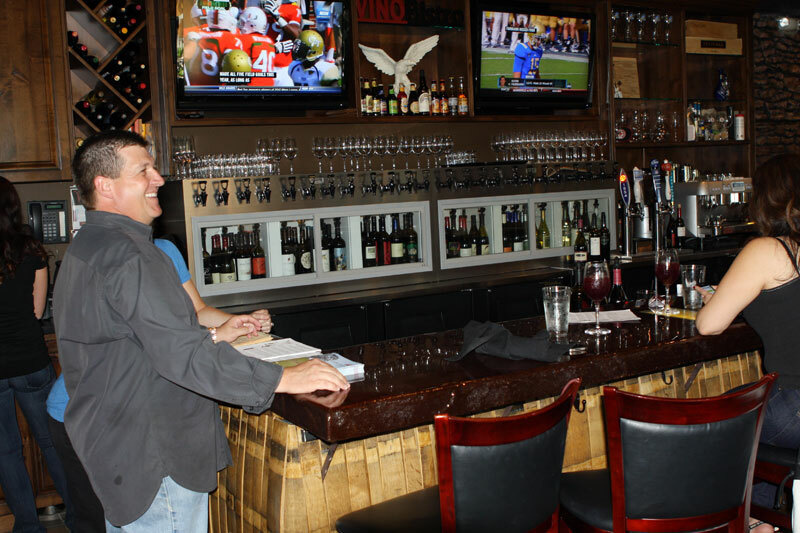 After opening their first wine shop in 2006, Chuck and Jen Van Fleet moved 75 feet down and reopened as Vino & Friends Wine Store & Bistro, Aug. 4, 2011. I arrived at Vino & Friends for a visit with Van Fleet and Steve Lister of JUSTIN Vineyards and Winery to talk about JUSTIN’s award-winning wines, Sept. 22. Van Fleet, a former Miller Brewing Co. rep. and General Manager for Auto Trader, was hosting Lister, JUSTIN’s wholesale sales manager. The bistro was abuzz. Lister was pouring and sharing tasting notes, so I spent my first 30 minutes with the Vino & Friends owner. Chuck and Jen’s vision for a wine bar had its roots while they lived in Sacramento. The couple often traveled to Paso Robles, San Luis Obispo and Napa Valley, visiting favorite restaurants and wine-tasting before deciding to become entrepenuers. The bistro’s table and bar were filled to near capacity as Chuck and I spoke. I marveled how the staff energetically interacted with the patrons, serving food throughout my three-hour (2-5 p.m.) visit. The atmosphere was relaxed, comfortable and easy. I saw plates of butternut squash ravioli and specialty burgers go out all afternoon. This is not just a wine bar. 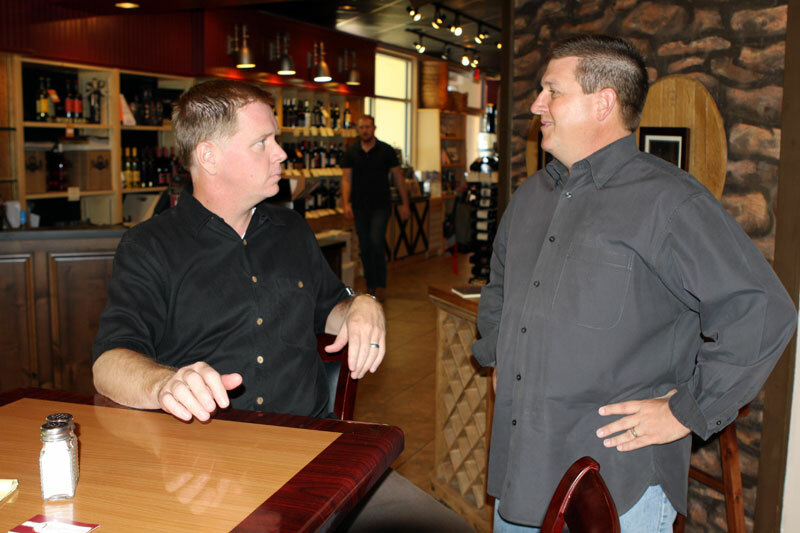 Owner Chuck Van Fleet, left, has expanded his wine bistro to include over 300 wines and 40 wines by the glass. The menu includes appetizers like stuffed figs and prosciutto-wrapped melon, ahi toasted minis or a Chef’s charcuterie platter are available besides salads, bruschetta, paninis, specialty burgers, pizza and pasta, and chef-created crepes. The original Vino & Friends only staffed four employees and now Chuck has 26 folks on the payroll. When new hires begin, Chuck trains all of them in tastings and flavor characteristics in food, beer and wine. They all know how to pair the food on the menu with the wine in the shop Chuck said. Chuck believes this has gone a long way to guarantee a successful bistro experience. Vino & Friends’ wine club is divided into two groupings: the Black Bag Club ($40/mo.) and Cellar Club ($80/mo.). 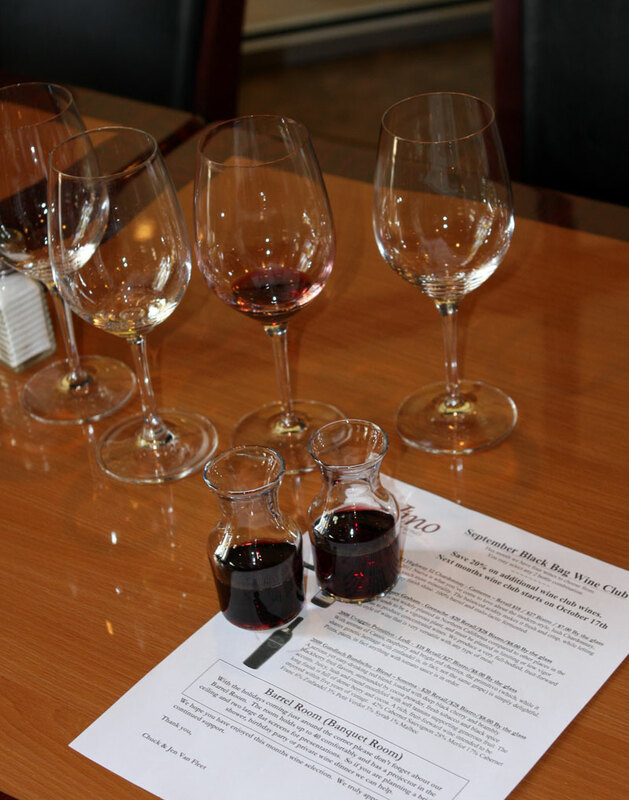 Wine tastings are $5 for members and $10 for non members. However, six beers are also on tap, including New Belgium and Firestone breweries. Today, Vino & Friends boasts over a 700 wine club membership that is growing each month and a wine list that has far exceeded the original offering. Van Fleet was careful to point out that Vino & Friends is not trying to compete with the Sequoia Brewing Co. when it comes to beer sales. When Chuck is not taste testing one of his 300+ bottles of wine for his inventory, he enjoys a glass of Heitz Cellars or Buehler Cabernet for dinner. In summer he enjoys a glass of Rosé or Pinot Blanc. Vino & Friends continued to buzz as Chuck was called to the back for a phone call. The demographics this afternoon were over 75% women, chatting over a glass of JUSTIN wine and appetizers. As the Clovis High’s 30th anniversary reunion leadership group began to arrive with flowers and decorations for their private party, Steve Lister shook Chuck’s hand sat down at my table. Lister immediately engaged with me, sharing how the Fresno wine market keeps him coming back three to four times a year. On this trip, Flemings Steakhouse was sponsoring a wine dinner and Chuck asked him to lead a JUSTIN wine tasting earlier in the day. Lister was quick to agree and was easily the star attraction this afternoon. He praised Chuck as a wine connoisseur and passionate about the wine business. With tables to the right of them crowded, Steve Lister, left, of JUSTIN Winery chats it up with Vino & Friends owner Chuck Van Fleet, during the Sept. 22 tasting. Lister was pouring JUSTIN wines during his two-day Fresno visit. A Wine and Spirits national salesman, Lister met his wife, Beth, five years ago while she worked at Napa’s Trefethen Family Vineyards. They both happened to be at a wine shop in Los Angeles, hanging out at The Wine House. 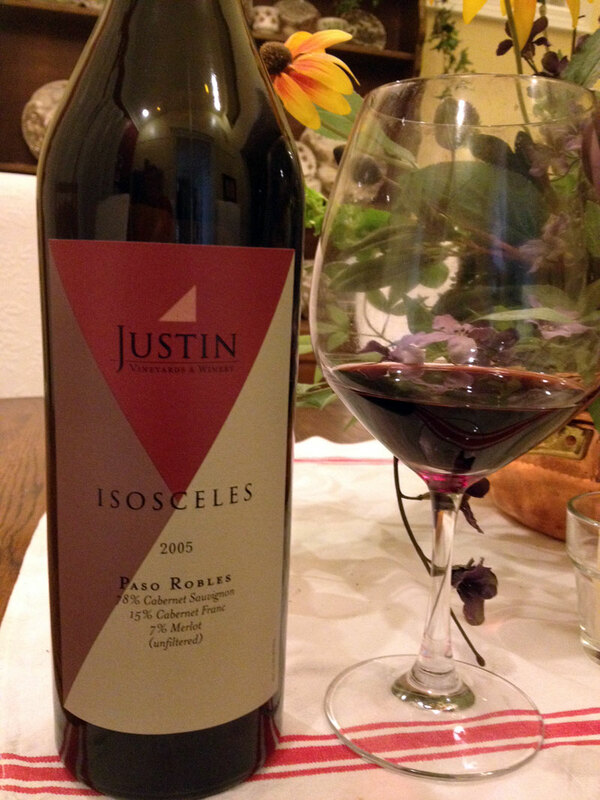 I have been a fan of JUSTIN Wines for a decade and recently opened a bottle of 2005 ISOSCELES during a wine dinner at my home. While that year is not readily available, the 2009 vintage is still for sale both at JUSTIN and at Vino & Friends. Normally quiet and shy away from the wine business, Steve is riding the wave of success at JUSTIN Vineyards and Winery, despite the corporate purchase of the winery from Justin Baldwin. Baldwin, who originally purchased 160 acres in 1981, planted Bordeaux-style blends from estate vineyards in the hills just west of Paso Robles. 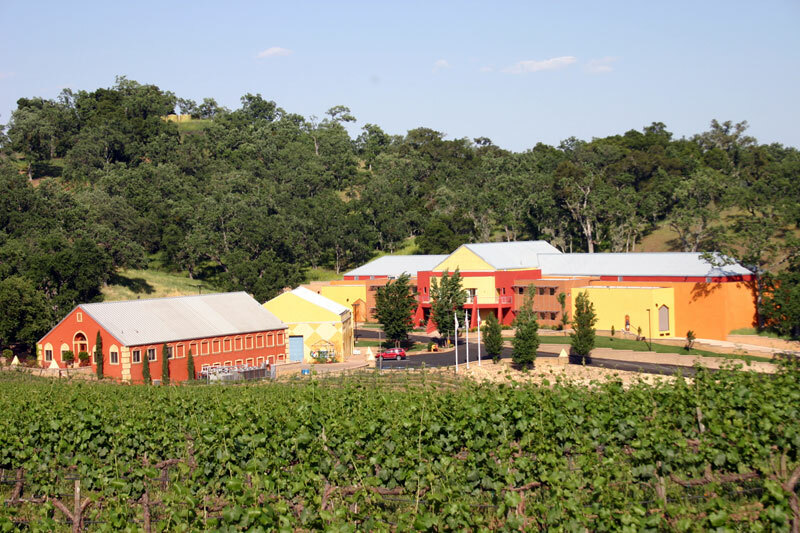 Today Lister has the enviable job of promoting award-winning wines that came from No. 1 wine region in the world (Wine Spectator 2010). But it wasn’t always that easy to sell JUSTIN wines. Lister has been around JUSTIN Winery for over ten years, watching the winery bottle 20,000 cases to 105,000 cases of wine last year. He started when the sales force numbered three folks to over a 100 this year, two years after the winery was sold to Fiji Water. “My biggest adjustment is learning how to utilize the new tools, people and personnel and recognizing all the additional resources,” Lister said. “The new owners and management have been incredible. We no longer just try to maximize our share of the California market, but are still a small winery going after a national market share. I have found Justin Winery to still be focused on customer service. My passion for wine and people have not changed since Justin Baldwin sold the winery. Founded in 1981 by Justin Baldwin, JUSTIN Vineyards and Winery is one of the “pioneers” of the Paso Robles AVA. Winery tours of the production facilities, ISOSCELES Center, Barrel Chai, and Caves are offered at 10:30 a.m., 2:30 p.m., and 5 p.m. daily. The winery came together as a result of Baldwin purchasing land west of Paso Robles when few wanted it. Lister said Baldwin always focused on quality and insisted on buying from partners in the area who had the best Cabernet Sauvignon grapes blended them to express a Bordeaux-style for the ISOSCELES and Justification labels. Their iconic bottle is the ISOSCELES Reserve. Sourced entirely from the home estate vineyard planted in 1981, this wine reflects the pinnacle of Baldwin’s efforts. Vines planted on native root stock, in nutrient depleted soils, are dry farmed and hand harvested. This label can only be purchased via the JUSTIN Wine Society. Today that quality and patience in building a world-class winery is still a focus as the new corporate ownership has put in new acreage and is introducing a new line of wine called Right Angle: a blend with 62% Cabernet Sauvignon, 19% Petite Sirah, 12% Malbec and 7% Petite Verdot. The 2010 is now available for a short time for $30. 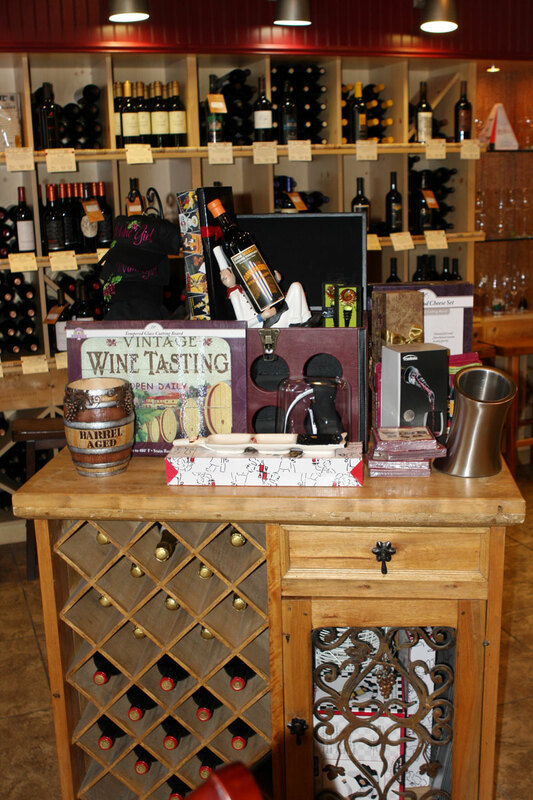 Wine tasting is available seven days a week at Vino & Friends. However, on this occasion, I tried the JUSTIN 2010 Cabernet Sauvignon. Special wine tastings are arranged each Saturday from 2-5 p.m.
After my hour with Lister, my wife, Geena, and I settled down for a tasting of the just released JUSTIN 2010 Cabernet Sauvignon. The bottle ($25) had been opened for less than an hour and was delicious. The nose was of black fruit and its velvety texture was ready to drink without food. However, we paired a Trio of Bruschetta ($10.95) to go with it and experienced Vino & Friends from the sidelines for the next hour. Today JUSTIN Vineyards and Winery is a 740-acre ranch, including 200 new acres of vines at the JUSTIN Estate Vineyard, DeBro Vineyard, the Adelaida Hills Vineyard and the newest addition: Templeton Hills. JUSTIN Winery is located at 11680 Chimney Rock Road, Paso Robles, CA 93446 USA. Be sure to inquire for upcoming events, including the JUSTIN Wine Harvest Weekend: Friday, October 19 – Sunday, October 21. Be sure to make reservations! They can be reached at 805.238.6932 or 800.726.0049. 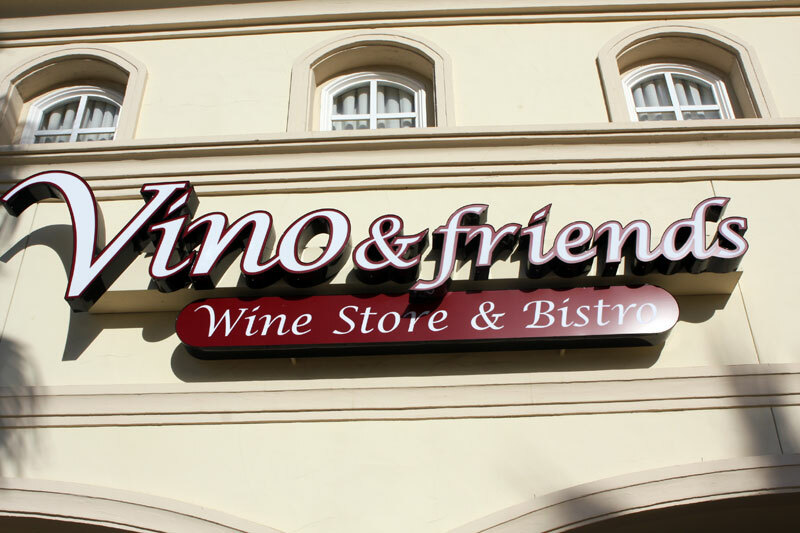 Vino & Friends Wine Store & Bistro is located at 1560 E. Champlain Dr., Fresno, CA 93720. Chuck Van Fleet brings in a new winery each Saturday for a tasting. The October 2012 line-up includes Jeff Runquist (Oct. 6), Rombauer Vineyards (Oct. 13) and Sextant Wines (Oct. 20) and Frank Family Vineyards (Oct. 27). Van Fleet is also planning a Brown Bag, blind tasting wine dinner for the first 22 people who show up at Vino & Friends, Nov. 7. The men are to bring a Cabernet and women a Chardonnay. The group will vote and the winners receive a free dinner. The cost is yet to be determined. A Nov. 14 beer dinner is also planned so please check their web site for more information. Vino & Friends can be reached at 559.434.1771. For more information on Vino & Friends, check out TasteFresno and their 2011 VIDEO interview of Chuck Van Fleet.